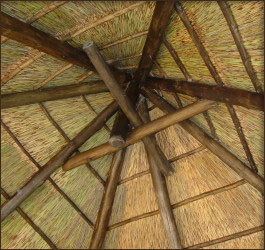 BUILD UP Thatch & Home uses CCA Celcure Saligna poles. Poles are treated according to S.A.B.C.S.753 & 754 and meet the requirements of S.A.N.S 1288,S.A.N.S1707. Timber is sourced from accredited suppliers that stock supplies from S.A. Wood Preservers Association registered treaters to ensure constant quality. All structures are designed by a competent person and constructed with guidelines provided by S.A.N.S and other relevant organizations and authorities. All pole diameters are a minimum of 75mm to 100mm up until a 6m length. Poles 5.4 meters and longer will have a minimum diameter of 100mm to 125mm. All upright support poles will have a minimum diameter of 125mm to 150mm.Rafters shall not be spaced apart more than 900mm centre to centre and trusses spacing to not exceed 3m.Full trusses are bolted at strategically placed load bearing points. All supports to be concreted in 600x600mm collar around to a minim depth of 500mm depending on soil conditions. BUILD UP THATCH & HOME in conjunction with Gripseal has determent that their non-toxic acrylic sealer is the ultimate product to be used on CCA poles. Gripseal sealants are absorbed by the pole and seal the pole surface from within, not merely a surface coating. The Imbuia sealer that is used by BUILD UP is stain resistant, non flammable and has a UV live span of 5years. Being a sealant it keeps in all the CCA and pole moisture, this limits warping and splitting of poles while still allowing the wood to breath. 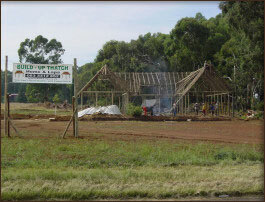 BUILD UP THATCH & HOME uses a combination of Cape reed (Thamnochortus species) and normal thatching grass (Hyparrhenia Hirta and Hyparrhenia Phillependula) in the thatching process. Grass bundles used have a diameter of 100mm to 125mm and have an average length of 1m.Thatching layers are 180 to 200mm comprising of 40 to 45 bundles per m²to a mass design of 90kg. A layer of 20mm to 30mm of Cape reed is used as the spray or ceiling layer. Cape reed is used to insure a smooth neat low dust retention ceiling. Cape reed is longer than grass and has no prominent leaves, rendering a tidy finish to the internal thatch. Cape reed is commonly used in Cape Dutch houses. Primary structures optimal pitch is 45°and secondary not to be less than 35°. 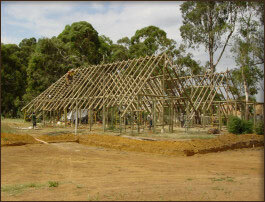 BUILD UP THATCH & HOME uses a 15year guaranteed polyethylene (RUGGET RIDGING). Our ridging manufactured in a factory that complies with the S.A.B.S polyethylene manufacturing standards. Rugget ridging is 3to 4 mm UV stabilized, colour fast, hail proof, crack resistant and 100% water proof. It is manufactured in Black, terracotta and light transmittance with polyethylene. The white ridging acts as a skylight and lets light in with a low heat transfer. Rugget ridging is the only pre manufactured ridging that complies to the S.A.N.S 10407:2004 standards. BUILD UP THATCH & HOME provides a full service and will ensure that the right people contact clients. BUILD UP THATCH & HOME is a Thatchseal applicator and complies with the DIN 4102 part 7 (fire behaviour of building material and building components for roof coatings)-STM 182-1979 (burning characteristics after 2000 hours weathering) and is compliant to the CI TT2 Fire Code. It is local metropolitan municipality specifications and acceptable for insurance purposes.